In 1869, Benton Clyde Clark was born in Kosciusko, Mississippi. Growing up as one of ten children, B.C. worked hard on the family farm, while also developing his strong sense of moral values and Christian beliefs. By the time B.C. turned 18, he was certain that life held more for him than a simple farm life. His older brother, J.F., had purchased a jewelry store in Abilene, Texas, and B.C. decided to move there and work for him. Over the next several years, B.C. learned the jewelry and watch repair trade. Hearing stories of people “making their fortune” in an area to the north known as Indian Territory, B.C. began dreaming of opening his own jewelry store in this exciting new land. He saved up some money, and in 1892 at the age of 23, he bid his brother farewell. Carrying his life savings of $50, his watchmaker’s bench, and a few other personal belongings, he boarded a train headed north. Simply because he was fascinated with the sound of its name, B.C. decided that Chickasha, Indian Territory was where he was going to make his fortune. He never made it that far, and the events of the next few months would shape the direction of the rest of his life. On his way to Chickasha, the train stopped in Purcell, Indian Territory. From there, B.C. would need to take another train on to Chickasha; however, when he reached for his fifty dollars, he discovered that his wallet was missing. Not only had his travel plans come to a halt, but B.C. no longer had any seed money to build his home or his fortune. Penniless, but determined, he began wandering around Purcell and as luck would have it, ran into a gentleman he had known in Abilene who was now operating a “racket” store, what we know today as the “five-and-dime.” As a favor to young B.C., the gentleman graciously allowed him to set up his watchmaker’s bench and small display case in one corner of the store. In the beginning, times were tough. One bright spot, however, was a young woman named Flora Edwards, who ran Purcell’s post office. Out of their initial meeting, when Flora loaned B.C. a dollar and a stamp, blossomed a friendship that led to a two-year courtship. In 1894, they were married. Eventually, business began to improve, and B.C. moved into his own store. One key to the early success of BC Clark Jewelers was the repair and inspection of watches for railroad employees. Purcell was a division point for the Santa Fe Railroad. Locomotives from the North Division (between Chicago and Purcell) and the South Division (between Galveston and Purcell) would end their runs at Purcell, turn around on a turntable, and head back the same way they had arrived. Proper timekeeping was critical during these times, and the railroads required that all company watches be inspected every 15 days. BC Clark’s expertise at watch repair soon became renowned among the railroad workers. During the economic panic of 1913, B.C. worried that his jewelry and watch business wouldn’t be enough to sustain his growing family, which now numbered himself, wife Flora, and six children. He decided to offer other sideline merchandise to keep his store’s traffic consistent. Therefore, in addition to the jewelry line, BC Clark Jewelers also sold phonographs, player pianos, the first General Electric refrigerators in the county, and the first Atwater Kent radios. As if this weren’t enough, B.C. also operated a car agency in Purcell where numerous automobiles, including the sporty Apperson Jack Rabbit and even a fire truck, were sold. 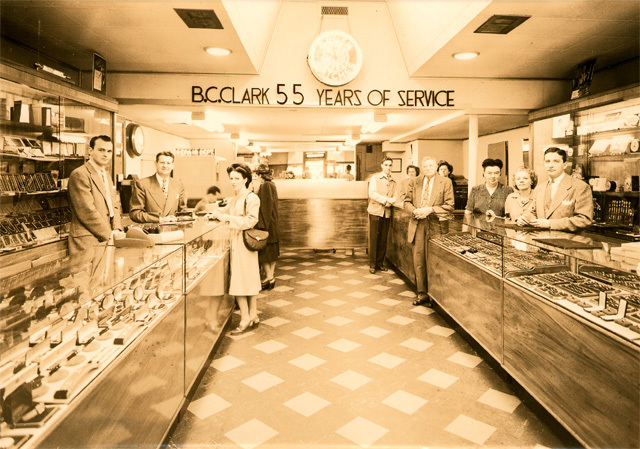 All items offered for sale were the top quality lines, including the jewelry and watch selection, which remained the primary product offered by BC Clark. Purcell had boomed during the 1800s, but never really grew to be a major city. During the 1920s, its population began to level off and Oklahoma City was growing by leaps and bounds. In 1929, B.C. purchased an existing jewelry store in downtown Oklahoma City. Little did he know that an event in the fall of that year would impact the nation’s economy for a very long time. After the stock market crash in October of 1929, several Oklahoma businesses were forced to close their doors, but throughout the duration of the Depression, BC Clark Jewelers remained solvent. B.C. had no outstanding debt, which helped enormously in weathering the economic storm, but his keen business mind also greatly contributed to the store’s success during those lean times. BC made a deal with a manufacturer to make railroad inspector’s watches with the serial numbers already imprinted on the inside of the watch. Usually, the serial numbers were assigned and written on a piece of paper that was placed inside the watch. Because the numbers had to be assigned in order, they had to print them ahead of time, and because newer numbers were the better numbers to have, the watches with “B.C. Clark Jewelers” on the face were in high demand. As an added incentive, railroad personnel who purchased their watches from BC Clark Jewelers could have the payments withdrawn directly from their pay, and then the railroad company would send the lump sum payments to B.C. Clark. It was smart thinking like this that assured B.C. a thriving business in the middle of the worst depression the country has suffered. Benton Clyde Clark remained actively involved in the business until his death in 1963 at the age of 94. The company continued to grow under the second generation leadership of B.C. Clark, Jr. with the addition of two suburban Oklahoma City locations. B.C., Jr. remained actively involved in the business until the age of 91. He passed away February 4, 2015 at the age of 101. Today, third and fourth generation Clark family members carry on the tradition of service started by B.C. 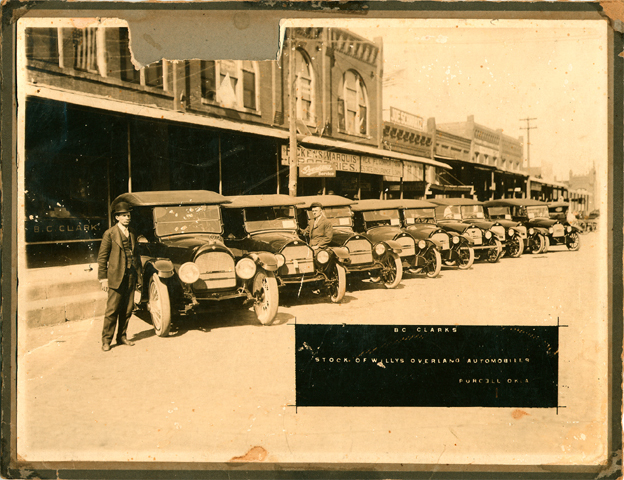 Clark over 120 years ago with three locations in Oklahoma City, and over 70 employees. From the wild days of Indian Territory, to the exciting time of statehood, and every decade since, many things have changed during the last century. But the legacy of superior products coupled with personalized customer service pioneered by B.C. Clark in 1892 hasn’t changed. BC Clark Jewelers is proud of its Oklahoma heritage and stands ready to continue serving the needs of the community for the next century and beyond.